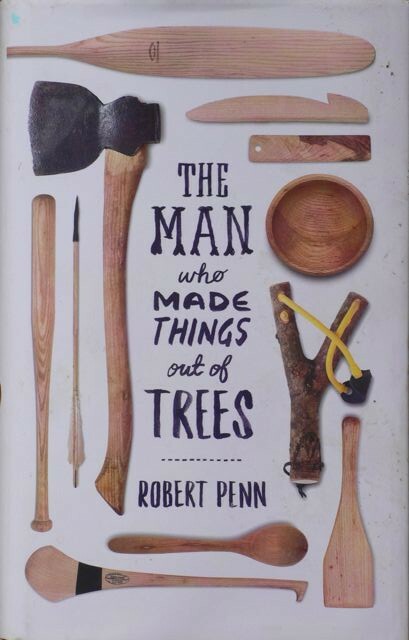 The end of October saw the launch of a new book by Robert Penn called ‘The Man who Made things out of Trees’. Three years or so ago, Rob featured in a TV series entitled ‘Tales from the Wildwood’, which I watched avidly, being entertained by his struggle to find ways of bringing British woodlands back into useful, productive management. I saw the publicity about Rob’s new book so ordered a copy online but was delighted when Rob then sent me a signed copy. It was rather smaller than I had expected and contained a few useful drawings but I was surprised that it had no photos at all. My wife pointed out that it was more along the lines of ‘nature writing’ rather than being a purely informative book, and books in this genre rarely include photos – it’s a book to read for enjoyment – a new concept to me. I entered into the spirit of this nature writing and soon became absorbed into Rob’s story of searching long and hard for an ideal ash tree, then having it processed (unfortunately, as with his TV programme all planked rather than any cleaving) and finding a range of crafts-people to make it into useful wooden artefacts. The book is obviously based on many of his experiences with the TV series, featuring the delightful Willie Bullough with his sawmill near Hay-on-Wye. Amongst other crafts-people, the book features fourth generation wheelwright, Phil Gregson, bowl turner and spoon carver Robin Wood, with even a cameo appearance from my good self. It is well written with many good descriptions of the people he meets on his journey. ‘Wiry, fit-looking, with a tuft of brown hair, square glasses, a gold earring and eager, searching eyes, he had the bearing of a Jester. If you had never met Robin Wood, this description captures him perfectly. If you do know Robin, then it has to make you chuckle. Although the book has the structure of a story, Rob deftly weaves in a great deal of information related to the ash tree, and its place in culture. I had no idea that in 1911 there were 23,785 wheelwrights in England and Wales. He has obviously read widely and in the middle of his wheelwright chapter, Rob launches off for four pages into a brief lecture about ‘the modulus of elasticity’. Despite having worked with ash for 30 years, I had no idea that my raw material was made of microfibril which ‘wind around the cells, spiralling upwards, a bit like the coils of a spring’. This book has something for everybody. Yesterday was wet and windy, so I was taking the opportunity to read a bit more of Rob’s book, when I received a phone call from Andrew Pickup, a forestry consultant at the firm Prior and Rickett, asking if I was interested in some ash logs he had for sale. (He must have picked up on my reading topic). Today was supposed to be dry, if rather cloudy so we arranged to meet at Weobley post office at 9am, about a 45-minute drive away. Unfortunately the rain band in the south of England had decided to wander a few counties northwards, so Andrew and I stood in the rain examining his six logs. They were bigger than I normally use but to justify the journey I agreed to take the one with the least crinkly bark, leaving the other 5 for someone like Rob Penn, looking for some straight ash to get milled. Andrew told me it contained 26 hoppus feet, which is the foresters version of a cubic foot. I said I pay £2.50 per cubic foot for chair-making wood, so after adding VAT and knocking a bit off for the knots, we called it £70. I measured about 5 metres of straight trunk before it became knotty, so sawed a 70cm length off the bottom end where the grain flares – this should make front legs for chairs. That left four lengths just over a metre, which I hoped would cleave straight and clean for back legs. I cut out the knotty sections (nice for any bowl turners – otherwise it will be for next year’s firewood – a reminder of an episode in Rob’s TV series!) then cleft the first section into quarters – very nice. Using a blunt axe and a wooden maul, I set about cleaving the metre lengths – better still. I worked out how many legs should come out of one of the halves – about 12. Not the ideal number. I would prefer 4, 8 or 16 to enable me to keep cleaving into halves. So now I chose to split each half into thirds, each wedge then yielding 4 legs on the outside, hopefully 2 more inside and then lots of other bits – either other chair parts or as Phil Gregson says in Rob’s book ‘just expensive firewood’. But without having paid for sawmilling or seasoning, my firewood works out at maybe twice the market rate, no more – and it comes ready split. About an hour after I started sawing the trunk into lengths, I had the whole lot cleft into manageable pieces. It then took another 50 minutes to hump it over the barbed wire fence and load it into the van, fortunately right next to the fence. I had brought a wheelbarrow just in case but it was not needed. I couldn’t quite fit in the metre lengths end to end, so had to stack them at one end – a bit of a pain but it looks very neat. The bits and bobs then fitted tidily in the remaining gap, along with chainsaw, axe, maul, wedge and the copy of Rob’s book that I had taken to read while waiting for Andrew to meet me. I then drove home, wet on the outside but glowing with the warmth of a 64-year-old who has just experienced that retirement is not necessarily the end of a fulfilling working life. The economics of this little adventure? Timber £70, four hours skilled(?) labour (including driving) @ say £20/hour, plus 50 miles @ 40p/mile, gives £170. I could probably sell each of those metre long wedges @£10 and have all the material for front legs and firewood for free. Or I could make the back legs for the 30 chairs on order from Denmark, that I’m supposed to be making with Peter & Ben and still have enough wood for next summer’s courses. We’ll see. In the meantime I’ll fit in reading the remainder of Rob’s book, which is inspiring me to crack on with writing the fourth in my own trilogy. The fourth in a trilogy? 🙂 looking froward to reading it.